Stockbridge, MA, August 30, 2018––Norman Rockwell Museum will hold an outdoor painting event, inspired by the Museum’s bucolic 36-acre estate, on Saturday, September 15, from 12 to 4 p.m. Artist Dan Howe will present plein air painting demonstrations, and then guide participants in the creation of their own artworks. 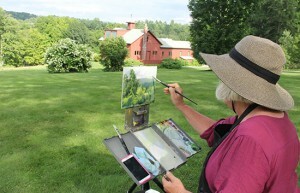 Visitors will be provided with an understanding of painting and artistic techniques while surrounded by the views of Rockwell’s studio, the Berkshire Hills, and the Housatonic River. Refreshments and an art discussion will follow the event, which costs $25, $20 for Museum members. Visitors interested in pre-registering can contact the Museum at 413.931.2221 or register@nrm.org. Well-known for his Norman Rockwell Museum art workshops and narrated painting and drawing demonstrations, Dan Howe is a contemporary realist painter and illustrator, and has created artworks for publishers, corporations, public institutions, and private collectors. He broke into the art field in publishing, and later studied painting with the Golden Age illustrator Tom Lovell. Howe has taught at the American Academy of Art in Chicago, where he also studied, and was an associate lecturer for the University of Wisconsin. Characterized by a strong focus on the structural patterns and atmospheric effects created by light and shadow, Howe’s art employs rich tonal harmonies and dramatic perspectives to establish a sense of illusionistic reality. Learn more at: www.danhowe.com.